Hasegawa 1/72 G3M2/3 Type 96 (Nell) "Houkokugou"
The G3M flew for first time in 1935, taking off from a Nagasaki airfield belonging to Mitsubishi Heavy Industries and landing at Haneda Airport on the outskirts of Tokyo. The G3M first saw combat in Japan's expansionist campaigns on the Chinese mainland in what became known as the Second Sino-Japanese War, where the G3M was able to exploit its long-range capability when, during August–November 1937, the "1st Rengo Kokutai" (a special unit) was established, operating alongside the "Kanoya" and "Kizarazu Kokutai" based in Taipei, Formosa, Omura, Kyūshū and Jeju Island. On August 14 of that same year forty-two "Nells" and seven Hiro G2H1s, escorted by 12 Nakajima A4Ns and 12 Mitsubishi A5Ms of the "2nd Rengo Kokutai" (a unit consisting of the 12th and 13th Kokutai), departed from their bases to cross the East China Sea, for the bombing of Hangchow and Kwanteh, and performed amongst others actions of terror bombing in coastal and inland targets in China, including the bombing during the Battle of Shanghai and Nanjing. Later, from bases in occupied Chinese territories, it took part in the strategic carpet bombing of the Chinese heartland, its combat range being sufficient to cover the elongated distances involved. Most notably, it was involved in the round-the-clock Bombing of Chongqing. When the Pacific War erupted in 1941, after the Bombing of Pearl Harbor, the G3M was by this time considered to be antiquated but still 3 front-line units (the 22nd to 24th Koku Sentai) were operating a total of 204 G3M2s in four Kokutai (Naval Air Corps) in the central Pacific and of these 54 aircraft from the Takao Kokutai were deployed from Formosa in the opening of the Battle of the Philippines. On the 8th of December 1941, (7th across the International Date Line), G3Ms from the Mihoro Kokutai struck Singapore City from bases in occupied Vietnam as one of many air raids during the Battle of Singapore, resulting in thousands of British and Asiatic civilians dead. Wake Island was similarly bombed by G3Ms from the Chitose Kokutai on the first day of the war, with both civilian and US Navy infrastructure being heavily damaged on the ground. The G3M was famous for taking part in the sinking of two British battleships with the more advanced Mitsubishi G4M "Betty", on 10 December 1941. "Nells" from the Genzan Kokutai provided important support during the attack on the HMS Prince of Wales and Repulse (Force Z) near the Malayan coast. Prince of Wales and Repulse were the first two battleships ships ever sunk exclusively by air attack while at sea during war. A G3M of the Mihoro Air Group was involved in a dogfight with a Consolidated PBY Catalina flying boat of No. 205 Squadron RAF near the Anambas Islands on 25 December 1941, in which the Catalina was shot down. The attack on Darwin, Australia on February 19, 1942, by 188 Japanese aircraft, included 27 G3Ms of the 1. Kokutai (1st Air Group) based at Ambon, in the Dutch East Indies (Indonesia). The "Nells" attacked alongside 27 G4Ms. These bombers followed an 81-strong first wave of Mitsubishi A6M Zero fighters, Aichi D3A dive bombers and Nakajima B5N torpedo bombers. From 1943, the majority of "Nells" served as coastal patrol aircraft, glider tugs, aircrew and paratroop trainers and for transporting high-ranking officers and VIPs between metropolitan islands, occupied territories and combat fronts until the end of the war. The difference between the G3M2 and G3M3 is that the latter had more powerful engines and was build solely by Nakajima. Externally, they were identical. This is one of the earlier Limited Editions of this particular kit. All the molds are pretty much the same. 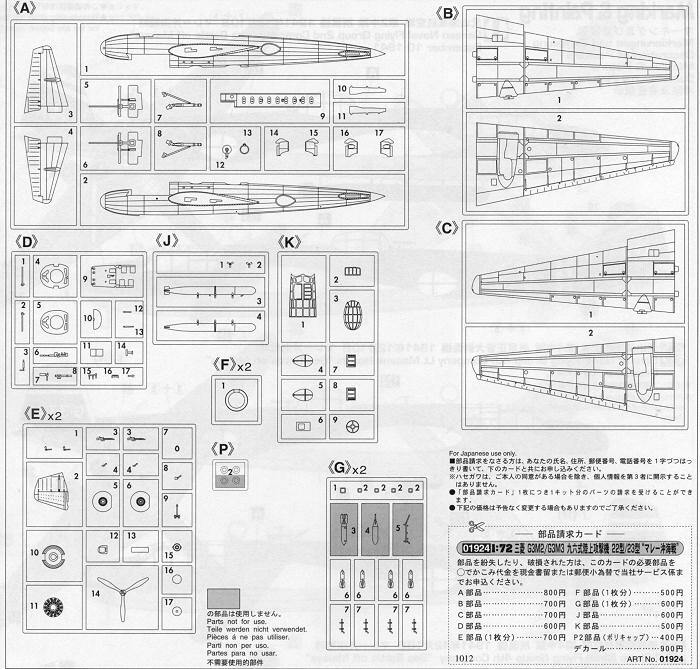 This particular kit does not include the torpedo shown in the parts layout, but otherwise, the bits are identical. So far, Hasegawa has done eight of these kits and they must be darn popular as most places I look, they are sold out. This leaves the auction houses to provide these for those who are seeking them. Like all Hasegawa kits, the external detailing is superlative. The interior detailing is not too bad either, but somewhat basic. There are decals for the instruments, which is somewhat standard stuff for most 1/72 kits. The cockpit has no sidewall detail with a pair of seats, control wheels and what I guess is a bomb release handle on the floor (since I do not think bombers have a parking brake). Behind the pilot is the bomb aimer's position with a seat and sight along with a pair of bulkheads. The side gunner's position appears to only be able to be built with the guns stowed. This is not true of the upper gun positions. In fact, the forward upper turret can be built either extended or retracted. The kit can be built with or without prop spinners, with the lower entrance hatch open or closed, with the upper cockpit hatch open or closed . Apparently Nell did not have a standard bomb bay with doors so it was more of a semi-external situation with the bay recessed into the lower fuselage. Bomb load is two somewhat large bombs fore and aft with eight smaller bombs (four to a side). The clear bits are quite clear so if one can find an aftermarket set to spice up the interior, it would not go to waste. Nell had long ailerons similar to what the Ju-87 had in that they protrude below the lower wing surface. These are molded in place so no worries on attaching these to the wing. Markings are provided for two planes. I did not show the decal sheet as we are talking about basically white markings which don't scan well. The first option is the box art plane in green and brown uppers with a light grey underside and black engine cowlings. This plane has no spinners on the props. It was with the 13th Naval Flying Group. The fin has the number 4-331 on it with a white stripe diagonally through it. THe other is an overall green upper surface plane with the tail code *390 from the Kasumimaura Naval Flying Group. Both of these are presentation aircraft (hence the houkokugou title of the boxing) with white markings on the side indicating who provided the funds for the plane. The latter plane has insignia with a green surround and no fuselage insignia. One nice thing is that these are obviously relatively early war planes as neither has a yellow wing leading edge. Peering through the plastic bag, the decals look pretty typical Hasegawa for the time. This is not an inexpensive kit, but it is a very nice one and sure beats out the older and off-scale LS/Arii kit. If you like Japanese twins, then it would be worth your while to seek this one.